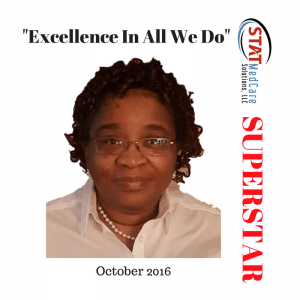 STAT MedCare Solutions, LLC management would like to take a moment to publicly recognize Cheryl Reddick for her contributions to STAT’s growth. To ensure our clients are always our #1 priority, we expect our team to live and breathe these values. An individual who strives for excellence is one that has outstanding quality work in all they do. They make sure that the work they accomplish is always above and beyond expectations. They never settle for not doing their best. They do their best at all times, no matter what the circumstances. We are recognizing Cheryl Reddick for her contributions to the STAT team. Cheryl Reddick joined STAT with over 29 years of experience in the healthcare industry, including credentialing, provider enrollment, billing, collections, and healthcare service practice management. She embodies the term “Excellence In All We Do” by continuing to be one of the best payor enrollment specialists on the STAT Team. Her impeccable work ethic, knowledge, and ability to please all of her clients play an instrumental role within STAT. Her hard working demeanor and dedication to her clients really shows through her work! Please join us in congratulating Cheryl for all her hard work! Thank you for your contributions to STAT! Joy Ortiz is the Marketing Specialist at STAT MedCare Solutions. STAT is a U.S.-based, national provider of credentialing, payor enrollment, rate negotiation, and other credentialing related services.